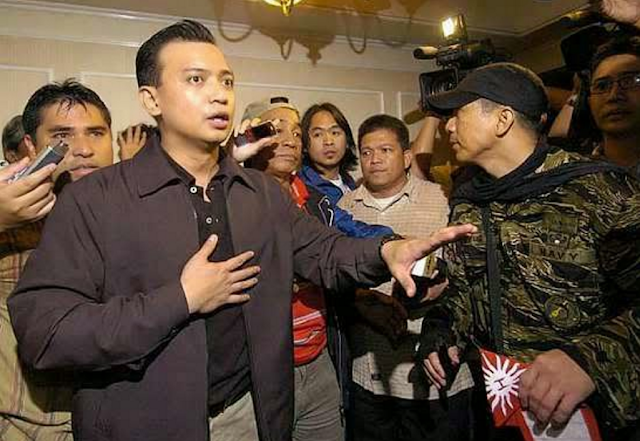 Home / local news / Opinion / Politics / MAGDALO member: Trillanes was a coward who avoided combat, "Puro daldal lang at porma"
MAGDALO member: Trillanes was a coward who avoided combat, "Puro daldal lang at porma"
A netizen said that Senator Antonio Trillanes in his days as a military man was cowardly towards physical combat. According to Cated J. Paul, a friend he knew which was a member of the Magdalo group which Trillanes functioned under, the Senator only wanted to be assigned inside offices to avoid physical combat. "Trillanes has never experienced combat and was a pencil pusher in the NAVY office all throughout his career as a soldier," the post read. The source said Trillanes was nicknamed "boy hotel" and "talawan" or coward for sticking with paperwork. The source also said that the Senator was "never the brains or the original founder of the Magdalo Group" yet reached fame after volunteering as the spokesman during thw 2003 Oakwood mutiny. Gerry Gambala was the group's founder. Trillanes, according to the source, was a "political mercenary but has no balls in actual combat and confrontationas, ika nga puro daldal"
Trillanes has been vocal in opposing President Rodrigo Duterte and his drug war. Sorry to say but one of my close friend is the mistah or batch of Trollanes in PMA Batch Marilag Class 95 & now an army scout ranger battalion commander & he is a humble soldier with a lot of gold cross medals. He told me that Trollanes has never experienced combat & was a pencil pusher in the NAVY office all thru out his career as a soldier meaning he always wants to be assigned in offices to avoid combat. BTW he was never the brains or the original founder of the Magdalo Group , it was Capt Gerry Gambala who is the real brains & leader of the Magdalo Group & the majority of the Magdalo Group now are working as Intel Officers in BOC recruited by Com Faeldon who was also a member of the group before, that is why there are 2 factions now in the Magdalo. Trollanes is dissapointed also because majority of the group are now with the PRRD admin only a few left on his group that includes the party list congressman named Gary Alejano who keeps on defending Delima too, my close friend told me that they even have a joke on Sunny Trollanes. They call him " Boy Hotel " because he keeps on hiding in hotels when plotting a coup, he only joined the Oakwood Mutiny 2 weeks before the coup & he volunteered as spokesman kaya sumikat ang gago ika nga he was a late comer to the group. We ilonggos & his mistahs describe him as " TALAWAN " or COWARD kasi ayaw pumunta sa gyera sa bundok gusto mag schooling lang at mag opisina sa HQ. He is a paid political mercenary but has no balls in actual combat & confrontations ika nga puro daldal lang at porma na parang asong ulol ....he was never a combat officer & a be medaled soldier itanong nyo sa mga mistah nya kung anong klaseng tao sya alam nila halos lahat na " Talawan " sya ....at tunay na Sundalong Kanin!